WHAT WILL HAPPEN DURING MY HYPNOTHERAPY SESSION? Firstly, and remember this is absolutely confidential, you and Sheila will talk about why you have come to see her and you will decide between you what it is you want to achieve. 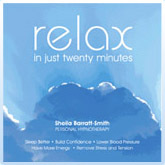 When you are happy with this, Sheila will help you to achieve a state of deep relaxation. When people say ‘I can’t relax’ they really mean ‘I don’t know how to’. Sheila will teach you. Your subconscious mind is a bit like a computer. You programme it every day with everything you do and all your experiences. While it is in this relaxed state, and receptive to beneficial suggestions, Sheila can put in a new programme which you have agreed between you to replace the old one. For example, replacing the old smoking programme with a new non-smoking one. THE FIRST HALF HOUR OF YOUR FIRST SESSION IS FREE. IF YOU FEEL THAT IT WOULD NOT BE RIGHT FOR YOU TO CONTINUE, THERE WILL BE NO CHARGE. And after just one session, you will feel the benefit. Of course, some things will take longer to deal with and you may well come back for more sessions. This is quite normal.